Hello and welcome to another tutorial about the method we use to build role-playing maps. In this tutorial Tailz will demonstrate his method of map building with Adobe Photoshop, using Studio WyldFurr’s Map Tiles art packs. Click on the following link if you are looking for our tutorial about map building with the Free & Open Source Image Editor, GIMP. In the window that appears, set the image dimensions to be 1800 pixels in height and width, this creates an area that is ten character squares in height and width. The resolution should be 72 pixels and the color mode should be RGB. With those settings in place, click Create and the setup image area will appear as the active canvas. Don’t worry about the size of the map at the moment, we can make it bigger or smaller when required. The blank map we just created is ten character squares wide and ten tall. Personal Note: One thing I do is I set the background to be a soft grey in color, I do this as I find a white canvas a bit bright and hard on the eyes. The next step to get our Blank Map Canvas ready is to setup a number of folders in the layers pallet. These folders will be used to help order and arrange our different levels during map construction. Features: This folder is where I put room features or special effects. Props and objects go into here such as tables and chairs. Walls: This folder is used when I use wall overlay map tiles. Placing the Walls Folder above the Floor Folder makes certain that my wall overlays will go over the floor map tiles. Floor: This folder is used to house the map tiles that display the floor of a building. 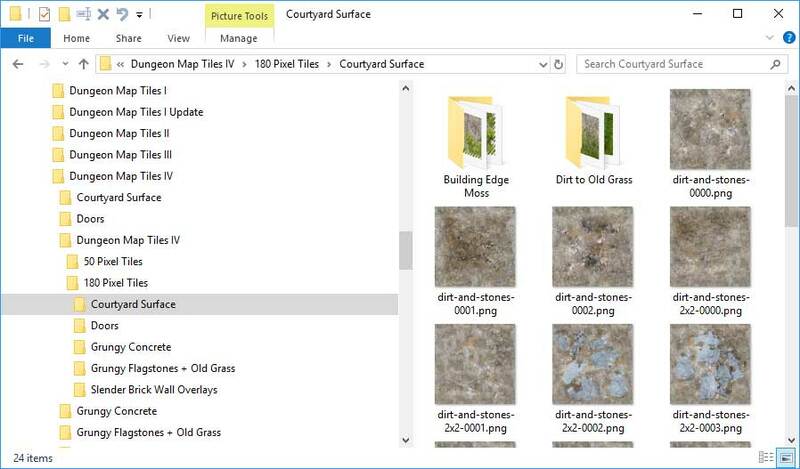 Map Tiles that include the floor texture and the wall texture go into this folder. Overlay Map tiles that only display the wall texture go into the Walls Folder above the Floor Folder. the foundations upon which I am going to build a building. When I am building an underground dungeon i hardly ever use this folder, but for surface buildings or wilderness maps, this is where I construct the ground level. With the Canvas prepared and the folders ready in the Layers Pallet, now you need to setup the guide lines which will help you position each map tile on the canvas. 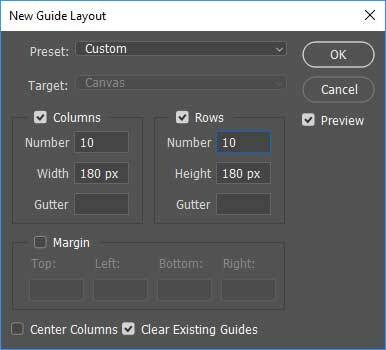 This will bring up the New Guide Layout dialog box where you will set the number of Columns and rows, and the width and height of those columns and rows. In our case we want 10 columns and rows with a width and height of 180 pixels. Now before we get started I need to explain something for those of you who are new to map building using Studio WyldFurr’s map tiles. Our map tiles range is designed for use with a scale of one square representing a 5ft. square area. We use this scale because this is the base map grid measurement used for character squares in Dungeons & Dragons. In the terms of image pixels, we convert the real world measurement into pixels via this simple equation: 3 pixels per each real world inch. This results in a character square that equals 180 pixels square. Thus each of Studio WyldFurr’s map tiles is based on a 180 pixel square measurement. Now that you have a blank map canvas all ready to go, you need to setup a file explorer window for easy access to the map files you plan to use. I make the window just large enough so I can see a thumbnail preview of a few map tiles and I can also scroll through the folder tree. This way I can browse through the different folders of map tiles. With the file explorer window setup, I move it up and to the left of my desktop so I can see Photoshop under it. This way, while searching for a map tile I want to use, I can see the map below that I am working on. With the Photoshop window set to Full Screen, and the file explorer window over it. To start map building all you need to do is drag a map tile from the file explorer window down onto the map canvas. Doing so will drop the map tile onto the canvas as a “Placed Graphic” object in Photoshop. 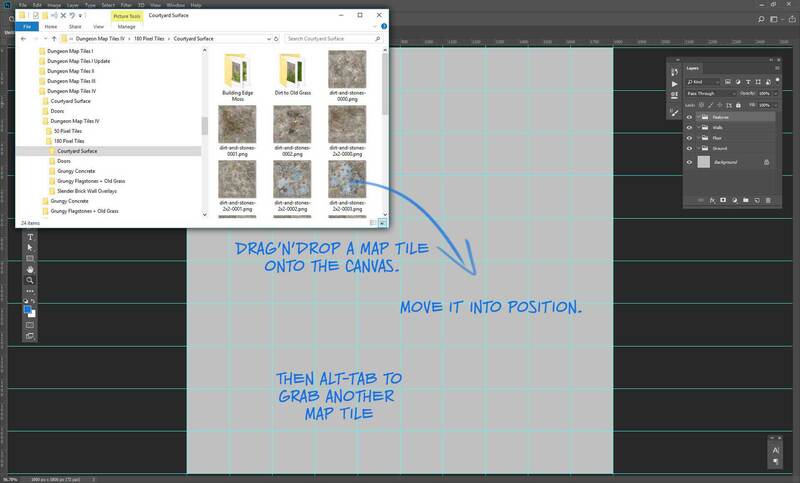 Use the move tool in Photoshop to position the map tile where you want it, while making sure the map tile is in the folder it belongs in (eg: put the ground surface map tiles in the Ground folder). Once the map tile is in position and your ready to place another, just press “alt-tab” to go back to the file explorer window (command-tab in Apple Mac), then repeat the process. Once you have completed building your map and placing the objects in each chamber, you will want to save a copy of the map so you can edit it later along with a version you can use in your game. Now that you have saved your working version of the map, you will want to export the map so you can use it in your game. If you plan to use the map you built in a Virtual Tabletop App such as Fantasy Grounds, Battlegrounds, Roll20, or d20Pro… you will want to export the map as a JPG file with some image compression. This will display another dialogue box, this time you select “JPEG Medium” from the “Preset” option box. Then down the bottom of the window click save, Photoshop will then prompt you for a filename and location where you want to save the image file. Exporting a map for print is a little more involved than exporting a map for use on the virtual tabletop. The main reason for this, is that most role-playing figures are designed for use on a one inch grid. Thus we need our map to print out with the character squares being equal to a one inch grid. 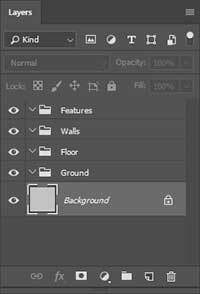 In the dialogue box that appears, untick “Resample Image” so that Photoshop does not change the image itself. 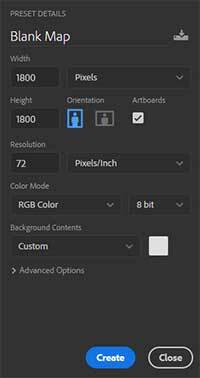 Then change the Resolution from 72 to 180 (pixels/inch). Once you have done that, click the OK button. An option box will appear and prompt you for a location and file name. This time same the file as a Photoshop PDF. Don’t forget that if you made a big map, you may need to print it out on a large piece of paper. Our artist Tailz employs Photoshop to build his maps, and we have a selection of videos from his many map building adventures. Check out the YouTube clips below to see how Tailz constructs his virtual tabletop maps with the Map Tiles.